An earthquake is a sudden vibration or trembling in the Earth. More than 150,000 tremors strong enough to be felt by humans occur each year worldwide. Earthquake motion is caused by the quick release of stored potential energy into the kinetic energy of motion. Most earthquakes are produced along faults, tectonic plate boundary zones, or along the mid-oceanic ridges (Figures 10m-1 and 10m-2). At these areas, large masses of rock that are moving past each other can become locked due to friction. Friction is overcome when the accumulating stress has enough force to cause a sudden slippage of the rock masses. The magnitude of the shock wave released into the surrounding rocks is controlled by the quantity of stress built up because of friction, the distance the rock moved when the slippage occurred, and ability of the rock to transmit the energy contained in the seismic waves. The San Francisco earthquake of 1906 involved a 6 meter horizontal displacement of bedrock. Sometime after the main shock wave, aftershocks can occur because of the continued release of frictional stress. Most aftershocks are smaller than the main earthquake, but they can still cause considerable damage to already weakened natural and human constructed features. Figure 10m-1: Distribution of earthquake epicenters from 1975 to 1995. Depth of the earthquake focus is indicated by color. Deep earthquakes occur in areas where oceanic crust is being actively subducted. About 90% of all earthquakes occur at a depth between 0 and 100 kilometers. (Source: U.S. Geologic Survey, National Earthquake Information Center). Figure 10m-2: Distribution of earthquakes with a magnitude less than 5.0 relative to the various tectonic plates found on the Earth's surface. Each tectonic plate has been given a unique color. This illustration indicates that the majority of small earthquakes occur along plate boundaries. Earthquakes are a form of wave energy that is transferred through bedrock. Motion is transmitted from the point of sudden energy release, the earthquake focus, as spherical seismic waves that travel in all directions outward (Figure 10m-3). The point on the Earth's surface directly above the focus is termed the epicenter. Figure 10m-3: Movement of body waves away from the focus of the earthquake. The epicenter is the location on the surface directly above the earthquake's focus. Two different types of seismic waves have been described by geologists: body waves and surface waves. Body waves are seismic waves that travel through the lithosphere. Two kinds of body waves exist: P-waves and S-waves. Both of these waves produce a sharp jolt or shaking. P-waves or primary waves are formed by the alternate expansion and contraction of bedrock and cause the volume of the material they travel through to change (Figure 10m-4). They travel at a speed of about 5 to 7 kilometers per second through the lithosphere and about 8 kilometers per second in the asthenosphere. The speed of sound is about 0.30 kilometers per second. P-waves also have the ability to travel through solid, liquid, and gaseous materials. When some P-waves move from the ground to the lower atmosphere, the sound wave that is produced can sometimes be heard by humans and animals. Figure 10m-4: The following animation shows the movement of a P-wave through rock. As the P-wave makes contact with the rock, the spacing between rock molecules contracts causing the volume of the material to decrease. The rock expands and returns to it original shape after the P-wave passes. S-waves or secondary waves are a second type of body wave. These waves are slower than P-waves and can only move through solid materials. S-waves are produced by shear stresses and move the materials they pass through in a perpendicular (up and down or side to side) direction. Surface waves travel at or near the Earth's surface. These waves produce a rolling or swaying motion causing the Earth's surface to behave like waves on the ocean. The velocity of these waves is slower than body waves. Despite their slow speed, these waves are particularly destructive to human construction because they cause considerable ground movement. Table 10m-1: Relationship between Richter Scale magnitude and energy released. 1.3 x 108 Smallest earthquake detectable by people. 2.8 x 1012 Energy released by the Hiroshima atomic bomb. 7.6 x 1013 to 1.5 x 1015 About 120 shallow earthquakes of this magnitude occur each year on the Earth. 7.7 x 1014 Northridge, California earthquake January 17, 1994. 2.1 x 1015 Major earthquake threshold. 7.9 x 1015 Turkey earthquake August 17, 1999. More than 12,000 people killed. 1.5 x 1016 Deadliest earthquake in the last 100 years. Tangshan, China, July 28, 1976. Approximately 255,000 people perished. 1.6 x 1017 San Francisco earthquake of April 18, 1906. 4.3 x 1018 December 26, 2004 Sumatra earthquake. 8.3 x 1018 Most powerful earthquake recorded in the last 100 years. Southern Chile on May 22, 1960. Claimed 3,000 lives. Figures 10m-5 and 10m-6 describe the spatial distribution of small and large earthquakes respectively. These maps indicate that large earthquakes have distributions that are quite different from small events. Many large earthquakes occur some distance away from a plate boundary. Some geologists believe that these powerful earthquakes may be occurring along ancient faults that are buried deep in the continental crust. Recent seismic studies in the central United States have discovered one such fault located thousands of meters below the lower Mississippi Valley. Some large earthquakes occur at particular locations along the plate boundaries. Scientists believe that these areas represent zones along adjacent plates that have greater frictional resistance and stress. Figure 10m-5: Distribution of earthquakes with a magnitude less than 5 on the Richter Scale. Figure 10m-6: Distribution of earthquakes with a magnitude greater than 7 on the Richter Scale. Time of day. Higher losses of life tend to occur on weekdays between the hours of 9:00 AM to 4:00 PM. During this time interval many people are in large buildings because of work or school. Large structures are often less safe than smaller homes in an earthquake. Magnitude of the earthquake and duration of the event. Distance form the earthquake's focus. The strength of the shock waves diminish with distance from the focus. Geology of the area effected and soil type. Some rock types transmit seismic wave energy more readily. Buildings on solid bedrock tend to receive less damage. Unconsolidated rock and sediments have a tendency to increase the amplitude and duration of the seismic waves increasing the potential for damage. Some soil types when saturated become liquefied (Figure 10m-7). Type of building construction. Some building materials and designs are more susceptible to earthquake damage (Figure 10m-8). Population density. More people often means greater chance of injury and death. The greatest loss of life because of an earthquake this century occurred in Tangshan, China in 1976 when an estimated 250,000 people died. In 1556, a large earthquake in the Shanxi Province of China was estimated to have caused the death of about 1,000,000 people. Figure 10m-7: Earthquake of June 16, 1964 in Niigata, Japan had a magnitude of 7.4. 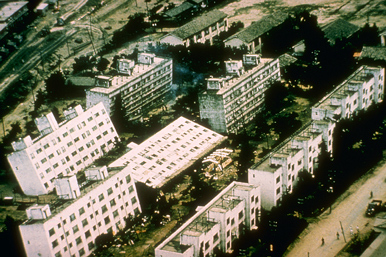 Liquefaction of some soils in the area caused large apartment buildings to tip over on their sides. (Source: Image provided by the National Geophysical Data Center, NOAA). Figure 10m-8: A view of a parking lot on the campus of California State University. 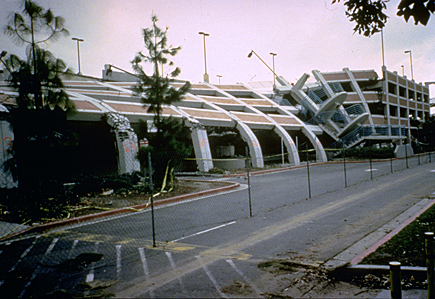 Columns of reinforced concrete failed after the 1994 Northridge earthquake and its aftershocks. (Source: Photography by M. Celebi, US Geological Survey. Image provided by the National Geophysical Data Center, NOAA). A common problem associated with earthquakes in urban areas is fire (Figure 10m-9). Shaking and ground displacement often causes the severing of electrical and gas lines leading to the development of many localized fires. Response to this problem is usually not effective because shock waves also rupture pipes carrying water. In the San Francisco earthquake of 1906, almost 90% of the damage to buildings was caused by fire. 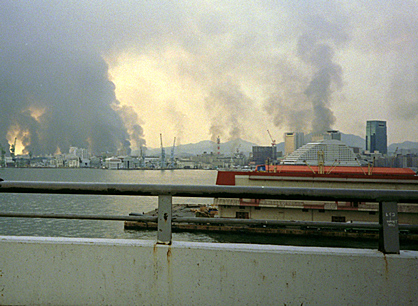 Figure 10m-9: The following image looks at downtown Kobe, Japan at about noon on the day of the 1995 earthquake. Many areas of downtown Kobe were on fire and there was no water pressure to put out the flames. (Source: Photograph by Roger Hutchison. Image provided by the National Geophysical Data Center, NOAA). In mountainous regions, earthquake provoked landslides can cause many deaths and severe damage to built structures (Figure 10m-10). The town of Yungay, Peru was buried by a debris flow that was triggered by an earthquake that occurred on May 31, 1970. This disaster engulfed the town in seconds with mud, rock, ice, and water and took the lives of about 20,000 people. 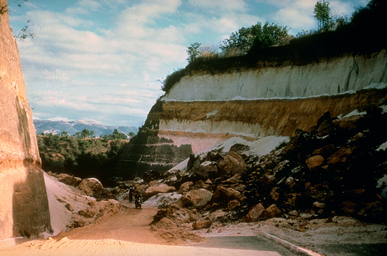 Figure 10m-10: The Guatemala earthquake of February 4, 1976 had a magnitude of 7.5. This earthquake killed about 23,000 people, injured 76,000, and caused just over 1 billion dollars in property damage. The earthquake also caused a number of landslides. (Source: Photography by US Geological Survey. Image provided by the National Geophysical Data Center, NOAA). Another consequence of earthquakes is the generation of tsunamis (Figure 10m-11). Tsunamis, or tidal waves, form when an earthquake causes a sudden movement of the seafloor. This movement creates a wave in the water body which radiates outward in concentric shells. On the open ocean, these waves are usually no higher than one to three meters in height and travel at speed of about 750 kilometers per hour. Tsunamis become dangerous when they approach land. Frictional interaction of the waves with the ocean floor, as they near shore, causes the waves to slow down and collide into each other. This amalgamation of waves then produces a super wave that can be as tall as 65 meters in height. Figure 10m-11: The earthquake of March 27, 1964, in the Gulf of Alaska generated a tsunami. 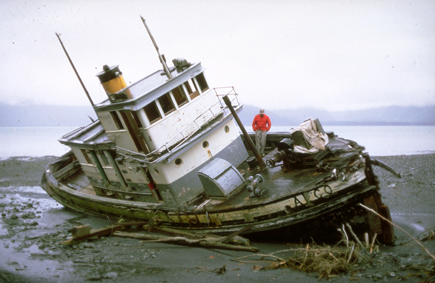 This photo shows a beached fishing boat that was carried landward by the tsunami wave. (Source: Image provided by the National Geophysical Data Center, NOAA).